We walked out to Bracegirdle’s House of Fine Chocolate for breakfast this morning. Being a good Hobbit name, I expected we could have had second breakfast as well if we wanted to, but a serve of muesli and a hot chocolate was good enough to charge us up for the day. Bracegirdle’s is also a chocolate shop, and has a sign boasting award winning chocolates. It seems every second cafe, bakery, winery, and restaurant in South Australia has won awards for something. The muesli was a gluten-free mix with no oats, but lots of little seeds and rice crisps. 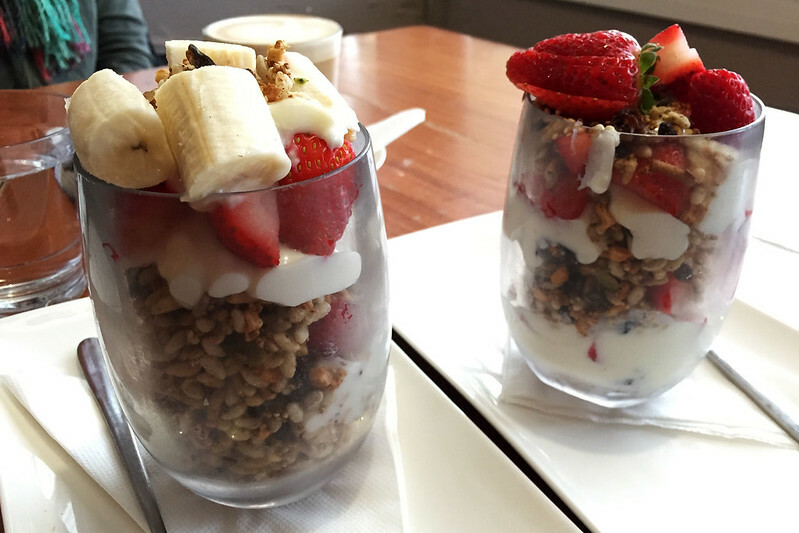 It came with yoghurt and fresh strawberries and banana slices, all piled in layers in a large glass. Which looks nice, but makes it highly impractical to stir and mix everything before eating it. It tasted good though. After breakfast we walked up and down the main street of McLaren Vale again, looking for a shop that M. had spotted yesterday and wanted to check out. We didn’t find it until we returned almost to our accommodation! It had various knick knacks and we bought a little thing as a gift for someone. Then we took to the car for a morning of leisurely driving before our lunch appointment at 12:30 at Red Poles. We encoded on a roundabout route via Perry’s Fruit and Nut Nursery, and a road up to Mount Wilson in the range of hills east of McLaren Vale. We though Perry’s would be an ad hard with a farm shop and cool fruit and nut products to buy, but it was actually a plant nursery, with small fruit and nut trees for sale! Nevertheless, we stopped and looked around, not having much else to do except visit more wineries, and we were a bit wineried out. They had an interesting and wide range of fruit trees, including avocado, fig, starfruit, guava, feijoa, walnut, macadamia, as well as the more standard apple, orange, lemon, lime, banana, blueberry, and mulberry trees. 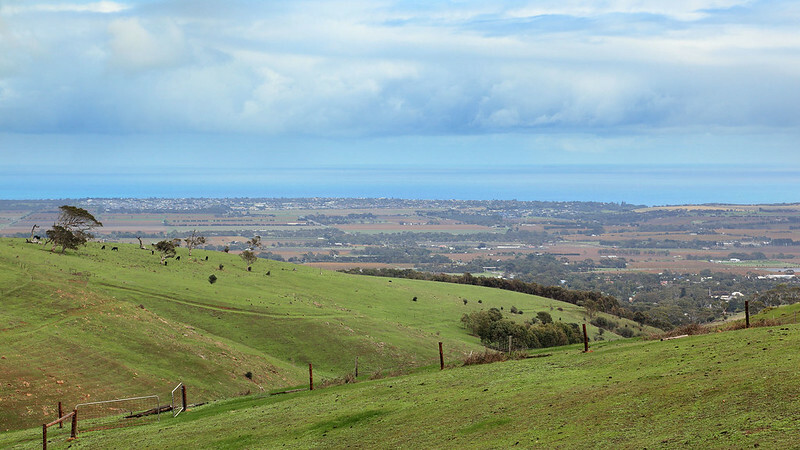 View over McLaren Vale from Mount Lofty Ranges to the east. Leaving the nursery, we took a road up the hills of the Mount Lofty Ranges and then a long road running along the ridge line to the south. I was hoping for a lookout spot, but the road was flanked by private property and there was nowhere good to pull over or to get a good view down into the valley. Eventually we turned into a road leading back down the hill and a little way along there was a spot to pull over near a lovely view down into spur valleys on both the north and south sides of the road. I took some shots of the dramatic storm clouds hovering over the valleys, hand holding a graduated filter to even out the light a bit. Back in the valley we drove through Willunga again to Red Poles, which is a restaurant and art gallery attached to a winery, and then also do beer tastings for a local microbrewery. M. had booked us for lunch as she liked the look of their website. They had a few vegetarian options and all of them looked so good to me that we split two small plates and a main, and I didn’t order anything with meat at all. The small dishes were corn fritters with a romescu sauce, and pan fried pumpkin bread with house made butter and a sweet salad of honey, grains, and chopped greens. The main dish was potato gnocchi with mushrooms, goat curd, broccolini, Spanish onions, and pesto. M. had a glass of local Shiraz while I tried the Vale Ale pale ale which was one of the beers they had for tasting. Everything was very good, and this meal was a bit lighter on the stomach than some of the others we’ve had on the trip, so it felt really good. 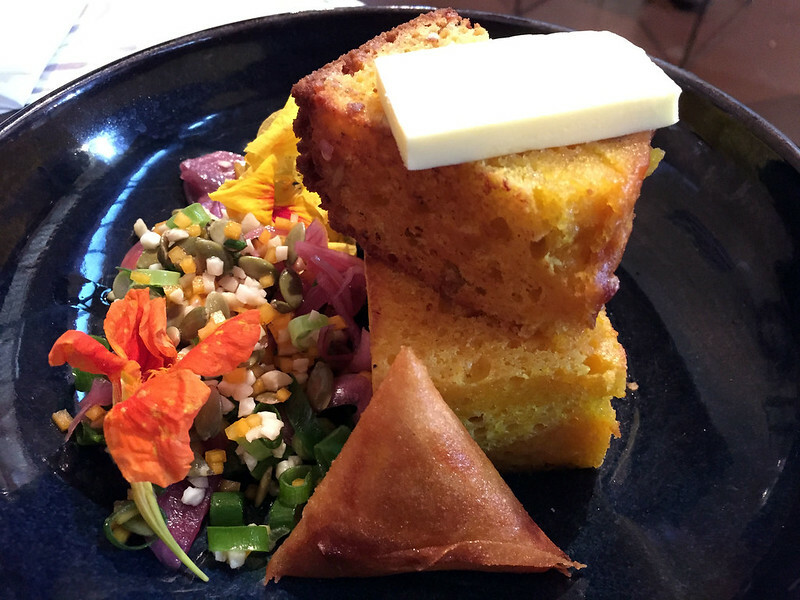 Corn bread with honey grain salad. After eating, I perused the gallery of paintings and other works. I then challenged M. to pick which work I liked. She walked the length of the gallery, then came back to a painting of a blue wren and pointed at it, “That one.” And she was exactly right, it was my favourite thing in the gallery. Then I challenged her to pick my top three, that being the first. She wasn’t so sure after that, but she indicated that she liked a set of nine small canvases with alternating paintings of red birds and strawberries on them, which was indeed my second pick! She gave up on the third though, and I pointed out a stylised colourful landscape of the local hills, which she said she never would have picked that I liked. Still, two out of three is pretty good! 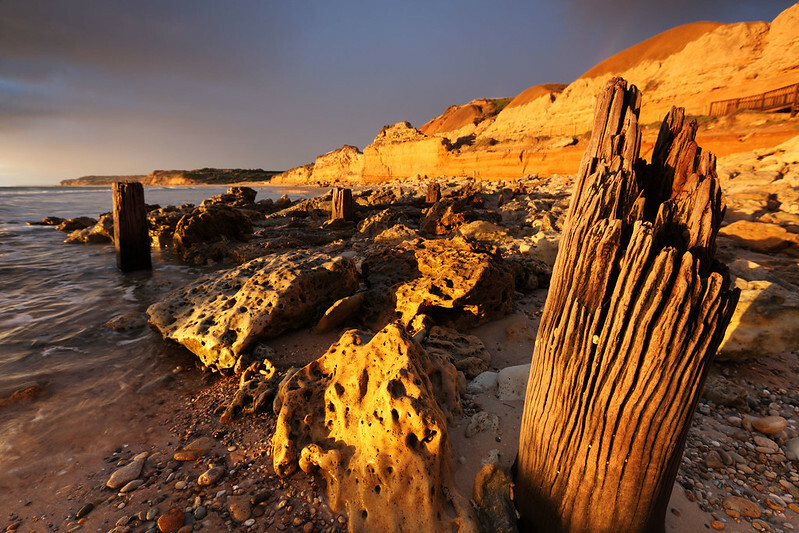 After lunch we drove out to the coast and the small neighbouring towns of Aldinga and Port Willunga. 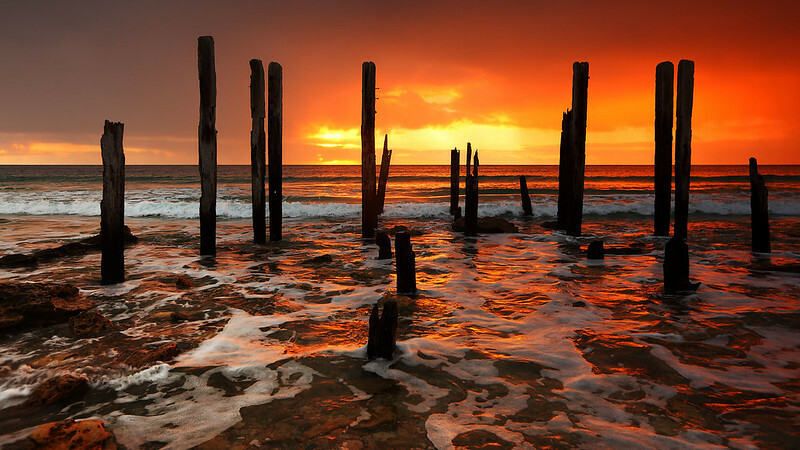 I decided to go to Port Willunga after seeing several photos in more than one place of a set of old jetty pilings sticking out of the water. The knick knack shop this morning had some prints for sale, and they pylons looked nice against a sunset or a stormy sky. So I was hoping for some scenic photographs, although the weather was still playing the mixed scattered cloud and rain showers tricks today, so I wasn’t getting my hopes up too much. 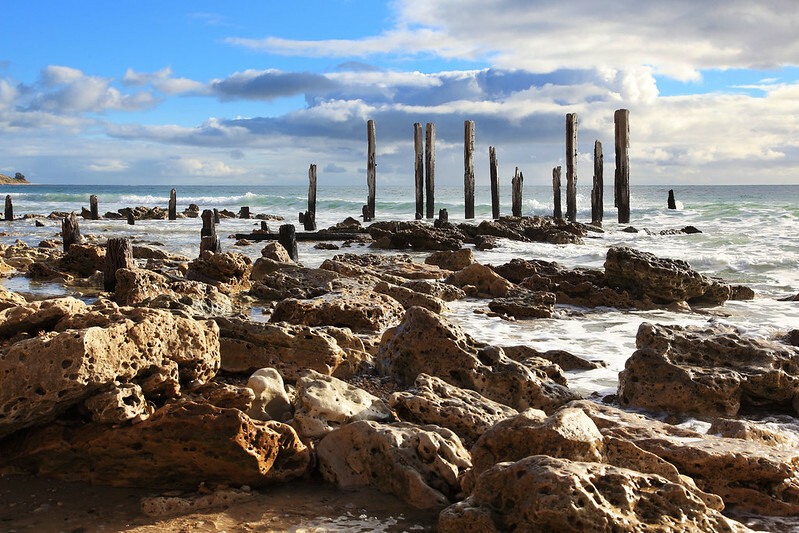 Remains of the old jetty at Port Willunga. We tried to drop in at a local gallery on the way, which was marked on our tourist map. But when we got there there was no sign at all of a gallery. There was just a farmhouse with an uninviting fence and closed gate. No signs or anything. We presumed the artist must have closed up shop or left. So we drove on to Aldinga, where we drove right down to the beach. We could have driven out onto the sand itself, as several people did while we were there. The sand was extremely firm and hard down to the waterline, making it easy to walk down the beach to get some photos of a line of poles which fenced off the northern side from cars driving that way. From here we drove north to Port Willunga, where a restaurant called the Star of Greece was located on a point overlooking the water. I had assumed it was a Greek restaurant, but in fact it was named after a three masted steel-hulled clipper by the same name which was wrecked just off the coast here in 1888. The wreck is still out there, and can be seen at low tide, and is also visible on Google Maps through the shallow water. 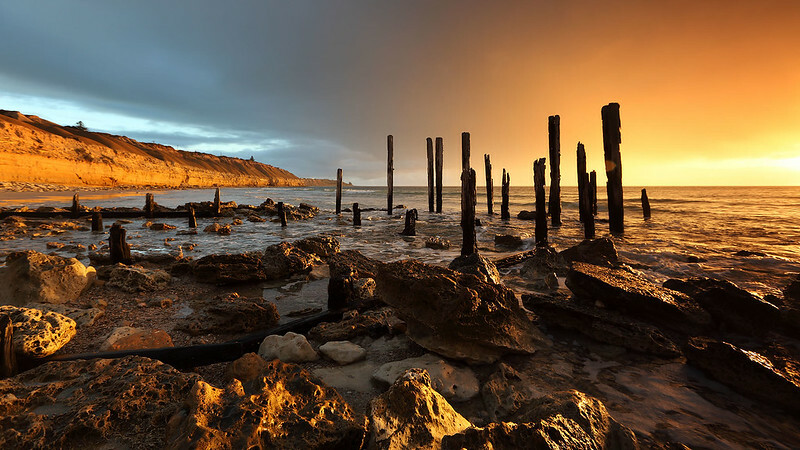 Anyway, near here is also the remains of the old Port Willunga jetty (also visible on Google Maps), which was presumably built to provide a deep water anchorage off shore where ships could unload. Now the only remains of the jetty are a cluster of rotting pylons near the shore. These are the pylons I’d seen in the photos in souvenir and art shops, and they made a great focal point for photos up and down the shoreline, which was quite dramatic as it was with crumbling orange clay cliffs fronting onto the beach. We took a few photos and then headed off to kill some time before sunset, as it was still almost two hours away. 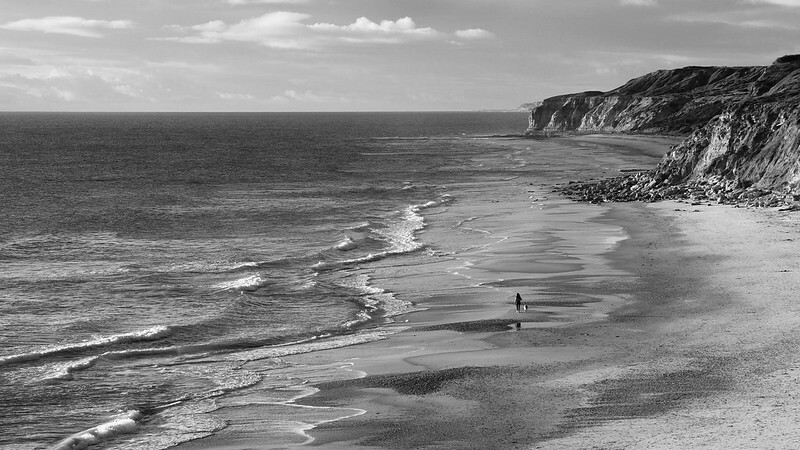 Woman walking dog, Port Willunga Beach. We drove around a bit until we found the Aldinga Central shopping centre. Here we walked around the shops a bit and M. got an iced coffee drink. We also checked out the local library, which was small but quite well equipped from such a small town, and very well patronised, with lots of people and children in there. They were having a sale of old books, and we perused the shelves for some time. I found an old hardback book in Italian, which had black and white photo plates of sharks and fishing boats and whales and stuff. I have no idea what the book was about, but presumably a non-fictional account of life on a fishing boat or something. I was half tempted to buy it, but put it back. We returned to the old jetty pylons about half an hour before sunset. The weather was kind to us, as the sun descended through bands of grey cloud, but poked through enough to provide a moderately spectacular light show. 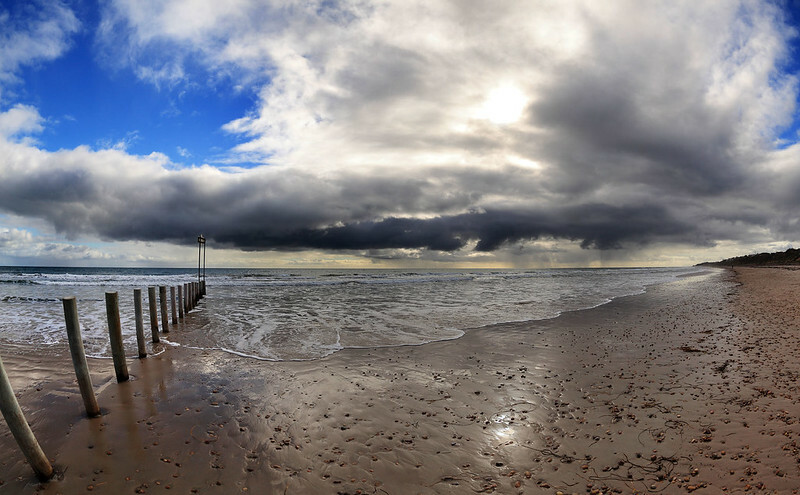 I pottered around the shoreline with three lenses and my graduated filter, taking several photos. As the sun reached the lowest band of cloud right on the horizon, I figured the best was over, but a woman appeared with a tripod, a dog, and a younger woman who I presumed was her daughter. She set up to take some shots of the pylons. I chatted with her for a minute, saying I thought the light was gone now and she’d just missed the best bit. She said she liked to take long exposures just after sunset, so I presumed she must come down here often to take photos. She said today was the best sunset she’d seen here for weeks, so it looks like I was fortunate indeed. Before we left, I grabbed one of my photo cards to give to her, and she gave me a business card, indicating she was a professional photographer, and with her Facebook page listed. We drove back to McLaren Vale and our motel, then walked out for dinner shortly after 18:00. We went to Oscars, an Italian place. Most tables inside were reserved, and we got a table in a quiet area outside, but sheltered from the cold by clear plastic sheeting, and warmed by a gas heater. 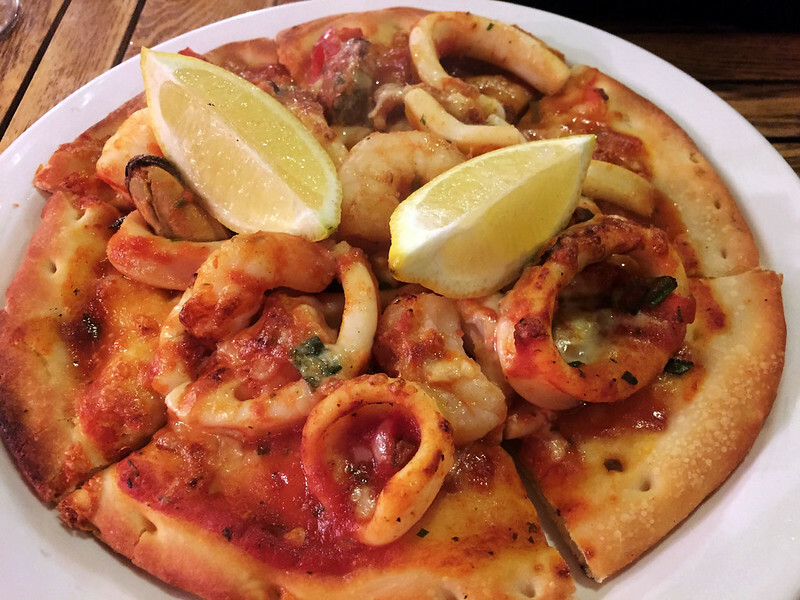 M. got a margherita calzone, while I went for the marinara pizza, which had prawns, mussels, calamari, and baby octopus on it. I also had a glass of local Reisling to go with it. The food was good and not too much, which was nice. We didn’t bother with dessert, as I still had a slab of rocky road from Melba’s Chocolate Factory to eat. We walked back to our motel, for our final night in South Australia. Tomorrow the plan is to get up and leave early, driving in to Adelaide to visit the Central Market for breakfast before heading out to the airport. This entry was posted on Sunday, 25 October, 2015 at 16:06	and is filed under Diary. You can follow any responses to this entry through the RSS 2.0 feed. You can skip to the end and leave a response. Pinging is currently not allowed.